1 page. 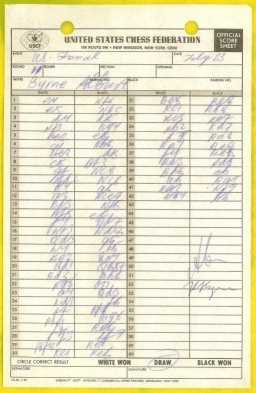 Octavo (8 1/2" x 5 1/2) Original hand written score of the game in round eleven between Lev Alburt(black) and Robert Byrne (in Alburt's hand) ending in a 42 move draw. 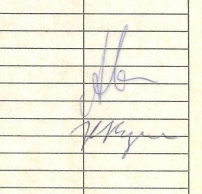 (Not listed in www.chessgames.com) Signed by both contestants. Lev Osipovich Alburt (b. August 21, 1945) is a chess grandmaster. Alburt was born in Orenburg, Russia, and won the Ukrainian Chess Championship three times, from 1972 to 1974. In 1976 he earned the International Master title, and in 1977 he became a GM. Defecting to the United States in 1979, Alburt led the U.S. Chess Olympiad team in 1980 at Malta. He was the U.S. chess champion two years in a row, in 1984 and 1985. Alburt drew an eight-game match in 1986 with British Chess Champion Jonathan Speelman. In the 1990 U.S. Chess Championship, Alburt defeated four-time U.S. champion Yasser Seirawan with the black pieces en route to winning the championship a third time.